Intel  put a revolution on its new processor at the beginning of 2018. Collaborating with AMD, new 8th Gen Intel Core processors will be wrapped with Radeon RX Vega Graphics  to drive the performance to a new high level and deliver excellent user experience of gaming, multitasking, video processing and more. In 2018 Q1, several new Intel processors were announced. What are them? Which of them is worth to buy? Let's check the full list of the latest Intel CPUs including QSV  in 2018. Bothered with slow video transcoding speed? Use the fastest video transcoder – WinX HD Video Converter Deluxe with Intel QSV hardware encoding/decoding tech. • Take full advantage of Intel Quick Sync Video to accelerate H.265/H.264 and other video encoding/decoding on notebooks, PCs etc, with new Intel processors 2018. 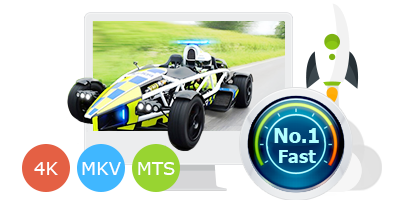 • Also support Nvidia NVENC helping you get the fastest video transcoding speed. • No quality loss. No video audio sync error. 100% Safe. The 8th generation Intel i3 model was launched in early 2018 as the same as traditional i3 models with 2 cores relying on hyperthreading. Not AMD Radeon graphics but Intel UHD Graphics 620 (integrated graphics unit) was packed in this 2018 new Intel model supporting resolution up to 4K @60Hz, Intel Quick Sync Video, DirectX to well handle UHD video processing, virtual reality, gaming and other entertainment jobs. Intel Optane Technology brings efficient and stable performance for tasks, and Intel Online Connect offers security for online browsing, logins and payment. Intel announced i5-8305G but hasn't launched it yet. This upcoming Intel processor has 4 cores based on Kaby Lake G architecture. Till now, it's the first i5 model using AMD Radeon RX Vega M GL graphics as discrete graphics with the ability of H.264/H.265 hardware encoding/decoding plus Intel HD Graphics 630 (processor graphics) including QSV to deliver grossly fast speed to stream, play and edit videos. On the other hand, HBM2 memory and 65 Watt TDP uplifts the performance to make it superior to implement demanding tasks. With i5-8305G processor, there are another 4 Intel i7 chips powered by AMD Radeon RX Vega M graphics were announced in CES 2018. Due to the discrete GPUs plus 4GB memory, computing on content creating, 4K video editing, game-play and multi-tasking arrives with outstanding performance. What we should mention is "deep immersive VR experience" on portable laptops and mini-PC benefiting from new Intel processors with Radeon graphics. 3D processing goes easier and smoother, from 3D image creation, 3D rendering/shading and other challenging tasks. Although the new Intel i7 CPUs roughly share the same features and technologies, there are some differences. The following specifications comparison may give you a hand for choosing the most appropriate model. All differences are highlighted. Bottom Line: So far, there are all new Intel processors which were and will be released in 2018. All those processors are not pricing at present. Nobody is sure for that Intel will launch more new and powerful chips in the following days. But we will keep pace with Intel and update the list with new or upcoming Intel processors in 2018 once Intel gives the announcement. ▶ Give the fastest speed to transcode videos among 4K, 1080P/720P HD, SD in any format with the support of Intel QSV hardware acceleration. ▶ Support hardware HEVC (H.265)/H.264 encoding/decoding to make it quicker and easier to transcode HEVC (H.265) and H.264 videos. ▶ Adjust video/audio parameters (bit rate, frame rate, aspect ratio, resolution & more) to meet your needs. ▶ Crop black or unwanted part on video images; trim videos into a segment; merge several videos into one; add external subtitle for a video; create a slideshow video with BGM from a photo album. QSV (Intel Quick Sync Video) - uses the dedicated media processing capabilities of Intel® Graphics Technology to decode and encode fast, enabling the processor to complete other tasks and improving system responsiveness.